I was invited to Indonesian-born couturier Didit Hediprasetyo's couture collection for Spring/Summer 2013. It was not a haute couture. But one thing I learned from the crazy complicated season arrangement, the kind of collection (metiers d'art, pre-something, the real thing, capsule, collaboration, made to order, etc etc) and layer of sophistication, there IS actually something between magnificent haute couture and mass-produced pret-a-porter. It's couture collection. 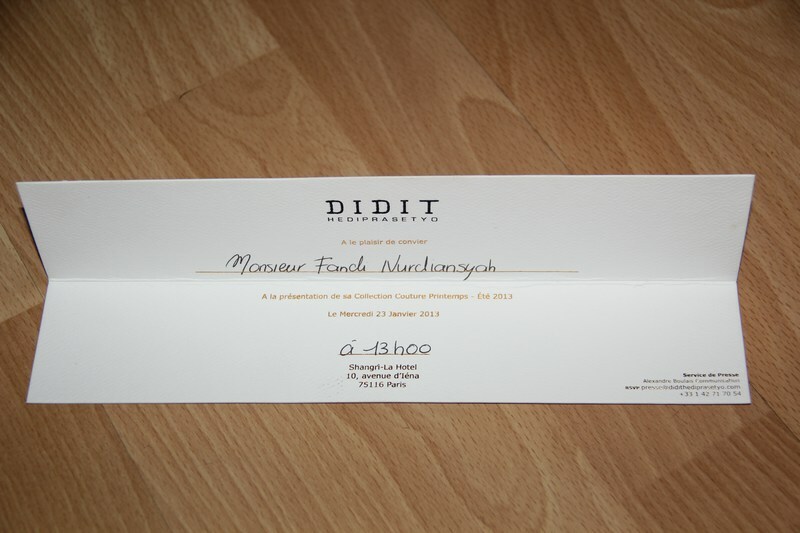 And Didit Hediprasetyo took my couture virginity the day invitation arrived in the mailbox of my representative in Paris. And no Parisian snow or storm can stop me to attend the show. The show took place in Shangri La Hotel, and it's named shangri la (means paradise) with a reason. It's gold colour everywhere it's so shinny. The elegance combined with exclusivity and simplicity of the runway (steps! Oh I can't imagine if there's someone falls) blew me away even since before the show started. One peek-a-boo shot of backstage visible from my row (no one is sitting!) gave me a little sight that the show would be featuring prints and fresh orange colour. Initiated by river sound and taiko drum beat, the show began. It's amazing that Didit is Indonesian (like me), and I'm so proud of it. The show was attended by very small number of people, which aforementioned, no one was sitting. We all stood on front of the runway, beside the photographers so we all got the best sight and everybody's happy because of this vantage point. His collection (I'll post it shortly later), which I think a personification of a blend between Chinese culture (or is it Japanese? The wooden sandals is so oriental, but the umbrella reminds me of payung muntho, an umbrella used in Javanese funeral as a symbol of ultimate protection and guidance, and also for members of higher caste like royal family) and western glamour. It's so fresh, with light material that made some models look like they're floating. The flow of some dresses are so breathtaking I want to be a girl. The collection offers a wide range of sleekness and simplicity, without forgetting the couture complication and intricacy. Divided into three parts, the collection contains Didit ideas of showing the couture for modern young women. The first round is, unusually, black series. The second is brighter, with bone-white colour and clear silhouettes. And the angelic looks are delivered to the third round. It feats bodycon floor-length dresses, little flowers, sun-bright orange, and incarnation of koi presented in remarkable prints by Calla Haynes. It looked like angels in shangri-la. I don't put my exits shots here. I put them in different posts, because there are many things happen in a show I want you to see, and for exits look, you can just do one tab and you'll see in other sites well-trained photographers took pictures with perfect proportions. I now can imagine how difficult it is, since those models walk (stroll!) incredibly fast, with one not yet exiting, the other already coming out. But still, go visit my blog in few future minutes, and you'll see my best selections of (oh my) hundreds of photos I took. Enjoy! UPDATE: The other posts containing the exits shots are linked in particular order of show rounds. Tab the link to view them. Terima kasih, Didit, for the amazing collections.